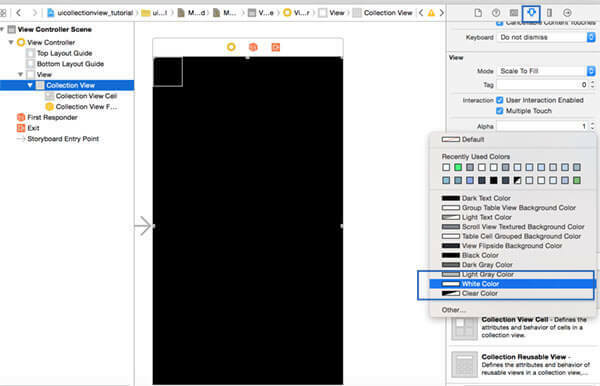 In this tutorial you'll learn how to define an UICollectionView custom cell layout for iOS 8 with swift. You'll see the basic steps for defining a collection view, a custom cell layout and data loading from url using the JSON format. 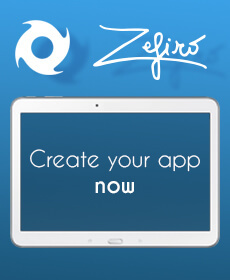 Let's create a new iOS single view project. Select the main.storyboard, disable the use size classes feauture and put inside the UIViewController a UICollectionView. Select the UICollectionView and under the attribute inspector set the background color to white. Select now the cell inside the UIViewController and set a custom size of 50x100. Put inside the UiCollectionView Cell two UILabel one below the other and set the constraints. Create a new ios cocoa touch class. Call it CustomCell subclass of UICollectionViewCell. Turn back to the main.storyboard, select the UICollectionViewCell and under the identity inspector set the CustomCell custom class. Under the Attribute inspector set Cell as identifier name. Open now the assistant editor. We'll assign now the variables to the view elements. Select the UICollectionView, by holding the CTRL key drag the element into the ViewController.swift class. Put as a variable name collectionview. Do the same thing for the UILabel elements inside the cell. 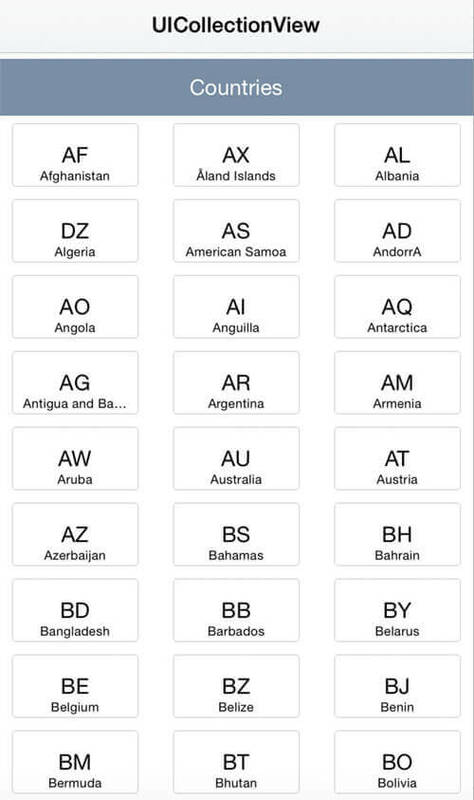 Assign to the CustomCell class the variables text and country respectively. Open now the ViewController.swift file, on the right of the class name append the needed subclasses UICollectionViewDataSource and UICollectionViewDelegate. Let's define now the collectionview cell size, elements number and content. Now the function for loading the data from URL and extracting the information from the json format are defined. If you want to read a more detailed tutorial about the json format, read Swift UITableView: Load data from JSON. Let's now add the header section to the UICollectionView. Turn back to the main.storyboard, select the UICollectionView and turn the header section on. 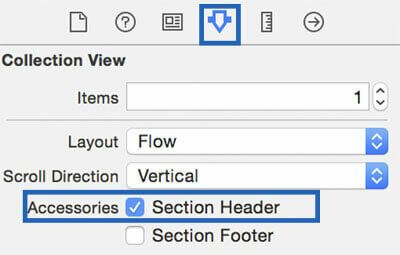 Above the custom cell, the header space will appear, select it and set the identifier name to headersection. Turn now back to the ViewController.swift class. Inside the viewForSupplementaryElementOfKind function you can set the custom cell content, by using the same procedure used to define the custom cell ( 1. custom cell creation - subclass of UICollectionReusableView, 2. assign the class name to the header in the main.storyboard and link variables using the assistant editor, 3. fill the content).